Homemade Guacamole Recipe is a quick and easy recipe that’s great for any party! 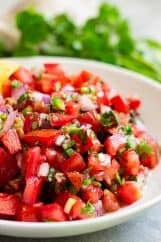 It’s healthy, great to dip chips or vegetables in, and it’s great with any Mexican dish! Just like Pico de Gallo I can eat a good Homemade Guacamole by the spoonfuls! I am a little more picky about my guacamole than my pico though. There have been several times at restaurants I couldn’t stomach their guacamole. 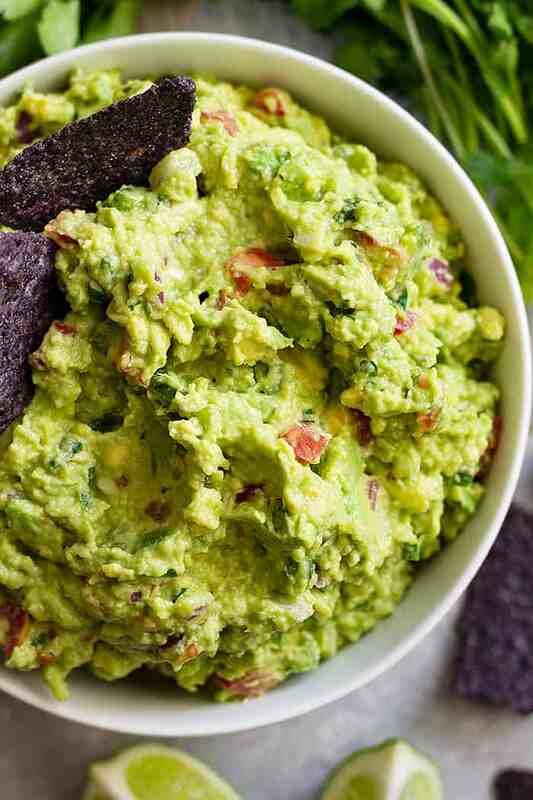 Thankfully making homemade guacamole is really easy and takes no time at all. 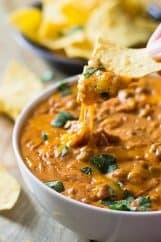 A few other great dips I have: Homemade Pico de Gallo, Homemade French Onion Dip, and Homemade Chili Cheese Dip. It’s so easy and once you have this basic recipe down it’s easy to make variations. I’m including a roma tomato in this recipe and I know most recipes don’t use one but we really like it this way and it adds a little pop of color. If you just can’t stand tomatoes leave it out, it won’t change the recipe that much. Having ripe avocados is VERY important to good guacamole. Give a gentle squeeze to your avocado and if it’s hard then it’s not ripe yet and it won’t taste good and it’s extremely hard to peel! When you gently squeeze the avocado it should give slightly anymore and it’s overripe and will be mushy. 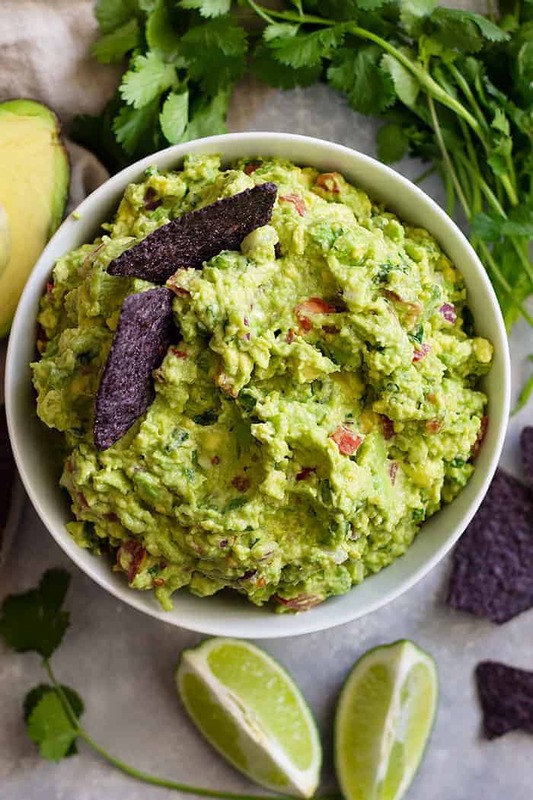 How to keep my guacamole from turning brown? 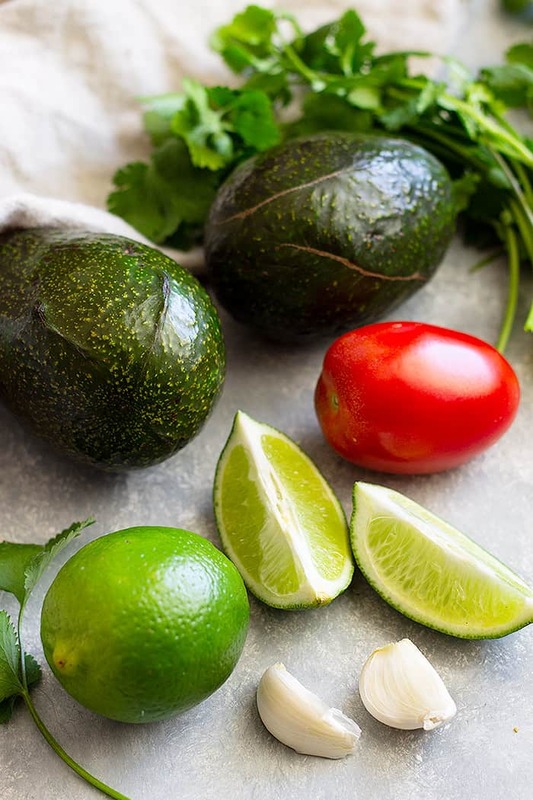 Use lime (or lemon) juice in preparing your guacamole. When storing your guacamole spoon into a container and spread into an even layer. Press plastic wrap over the top making sure not to trap any air pockets. I do this all the time and it greatly extends the life of my guacamole without it turning brown! Starting with ripe avocados (see note above). Texture: this is about preference. Some people like super smooth guacamole, I do not. 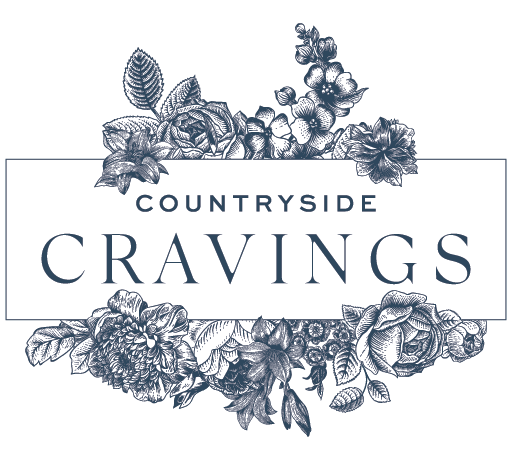 I like a few chunks in mine and I achieve that by using a potato masher. Be sure the other ingredients are finely chopped though. I don’t dice my avocado either. I just cut into 4 wedges, remove the seed, then peel the peeling off the avocado. No need to get a spoon out and scoop. Season: I like to add cilantro, onion, and garlic to my guacamole. Not a lot of garlic or it will quickly overpower it. I also use plenty of salt. It’s amazing what just a little salt can do for flavor. The tomato is really just for color and if you don’t like tomato just leave it out. I have also added a pinch of cumin to guacamole for a little different flavor. Again just a little or it will overpower. Lime juice: this is a must to prevent browning and it also adds flavor. If you don’t like limes you can also use lemon juice. And fresh is best here! Don’t use the bottled lime or lemon juice. On top of scrambled, fried, or poached eggs. Or on top of an omelet. 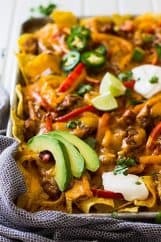 Served with tacos, burritos, enchiladas, quesadillas, and nachos. On toast topped with choice of egg. Use it in place of mayo on a sandwich or in egg salad. 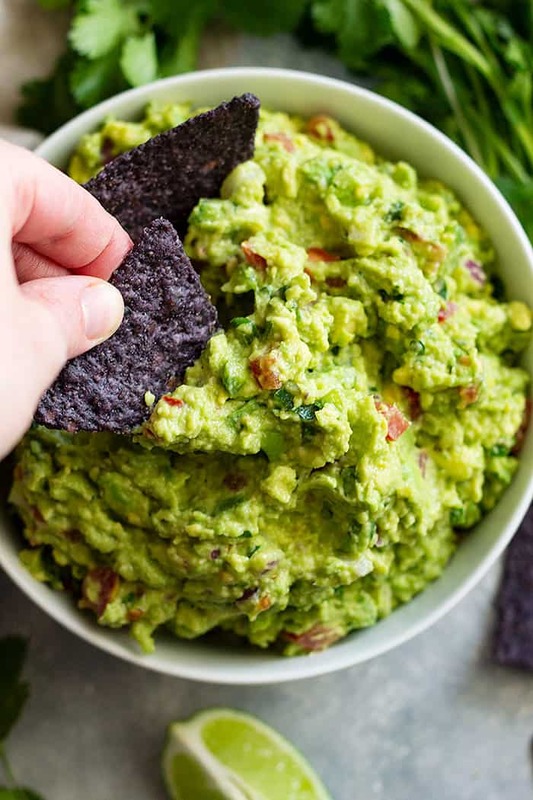 Homemade Guacamole Recipe is a quick and easy recipe that's great for any party! It's healthy, great to dip chips or vegetables in, and it's great with any Mexican dish! Cut ripe avocado into quarters, remove seed, and peel. Place into a large bowl. Using a potato masher mash avocado until it reaches your desired texture. I like mine a little chunky. Stir in remaining ingredients and taste. Add extra salt as needed. To store: spoon into a container and spread into an even layer. Press plastic wrap over the top making sure not to trap any air pockets. I do this all the time and it greatly extends the life of my guacamole without it turning brown! Store in the refrigerator for 2-3 days. I have never made Guacamole but will try to one of these days. Will wait until I get somewhere bigger as the avocados we get here are always so hard and just don’t ripen. Homemade is definitely better than the store bought for sure! Thanks Grandma! This sounds like an amazing guac recipe! Guac holds a special place in my tummy!!! 😉 I LOVE GUAC!!!!! This looks INCREDIBLE! Your pictures are so good! As is this guacamole! 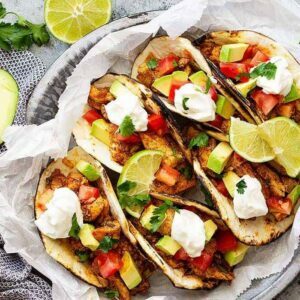 Hi Malinda this looks like a great recipe, definitely use fresh vegetables over powdered ones they are fragrant vegetables in Chef Parlance & as soon powdered the flavor starts off gassing. I like to use equal amounts of Cumin & Coriander, a tip I picked up some time ago, each enhances the other to create a real flavor experience. On our anniversary we ordered from a Local restaurant, & got some guacamole, they serve itt in an interesting presentation you might like. It starts with amedium mashed guacamole, they top it with a generous heaping of chunky very warm Pico de Gallo & a hearty sprinkle of Feta ( I thought it strange, but cotija isn’t available in Boston???) 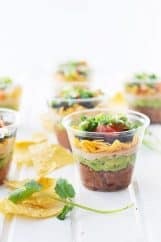 the Idea is to stir as much of the topping into the guacamole as you like or scoop some of each on a chip. I ordered the gluten free because it came with celery, cauliflower & cucumbers for dipping, broccoli would be good as well. It was excellent, I thought it might interest you as it was very colorful. Picked up some Mexican Style Recipes this time, you have some really nice recipes, I have visited before, & will return. Thank you. Regards MA from Boston, MA.